Give yourself peace of mind and have your Initial Consultation with one of our dentists! If you are thinking of having dental treatment abroad because you are attracted by the low prices but realise it's a big decision to make, why not book your initial consultation at our Dublin or London practice. 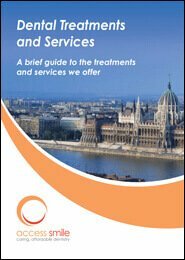 Access Smile Clinics are wholly owned and managed by Access Smile which is why our levels of aftercare and support are unsurpassed by any other clinic we know of in Hungary, London or Ireland. Access Smile has been organising dental trips to Budapest from Ireland since 2004. We are recognised as the leaders in overseas dental services and are the most experienced dentistry practice in Hungary providing dental treatments for foreign patients.